Mineral insulated cable is manufactured from completely inorganic material. The copper sheath and conductors, insulated with magnesium oxide ensure that the cable is able to withstand the effects of fire and is fully usable afterwards. 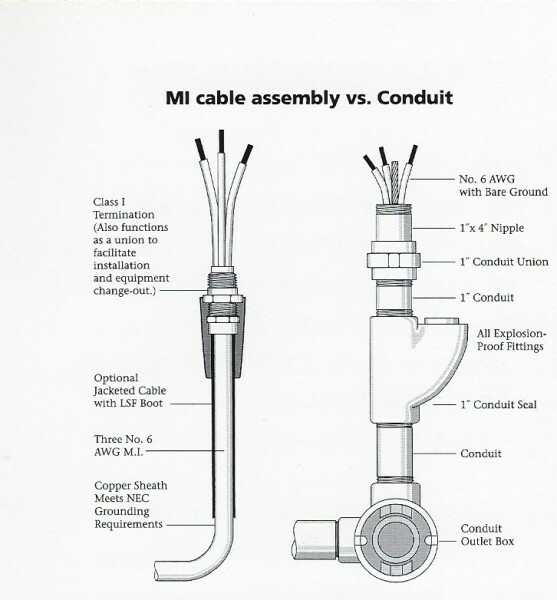 The MI cable system provides a simple solution to many difficult wiring problems and makes for a dependable and permanent installation for virtually all types of electrical circuits. The copper cable sheath meets NEC grounding requirements. Suitable for 300 and 600 volt applications. Pressure tested to 2000 psi. MI cable complies with Articles 330, 500 and 501 and all other applicable provisions of the National Electric Code. To manufacture MI cable assemblies, the cable is cut to the desired length, pigtails are brazed on and terminated with male NPT threaded compression glands. Why Choose MI Cable Co.
All rights reserved © MI Cable Co.